Tutorial : Using rtorrent on Linux like a pro . And this will install the rtorrent for you . Now rtorrent is installed on your system . If there is any problem installing it from source then ask me for help in the comments . 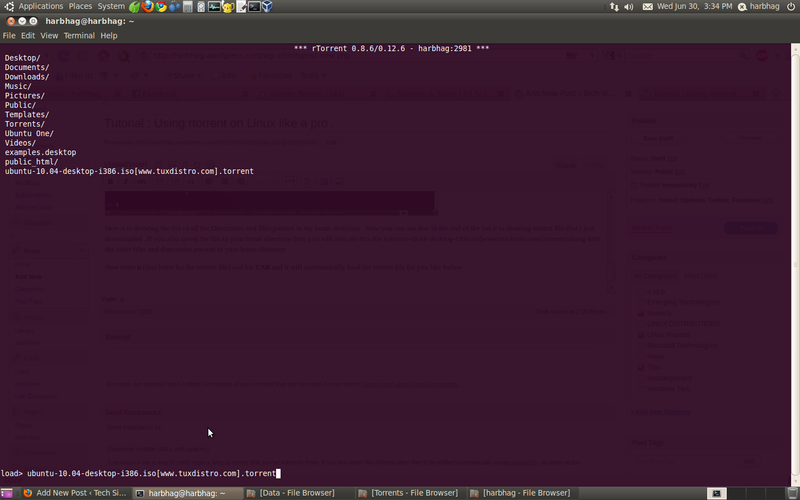 When you will first start it , it will show a warning that configuration file .rtorrent.rc not found .Just ignore it . I suggest that you never run rtorrent as a root . Before we begin configuration you need to create few directories which will be used by rtorrent . Suppose that your user name is foo . Then the user foo will create the following directories . 1. Default directory to save the downloaded torrents. Open your terminal and issue the following command without root (sudo) . The above command will create a directoy named rDownloads in your home directory where your dowloaded torrents will be saved automatically . Remeber that you must change foo with your own username . 2. Default session directory . This is very important as it will contain data related to your download , paused , completely torrents . This will create a directory in your home directory of name session and it will be used by rtorrent to save its current session . Alright now you have created the directories required so now we can move on to the actual configuration part . So first of all download this files and save it on your computer. Alright now your configuration is complete . Now save the file and copy the file into your home (/home/foo) directory . And issue the following command . The above screenshot is having the following useful information . 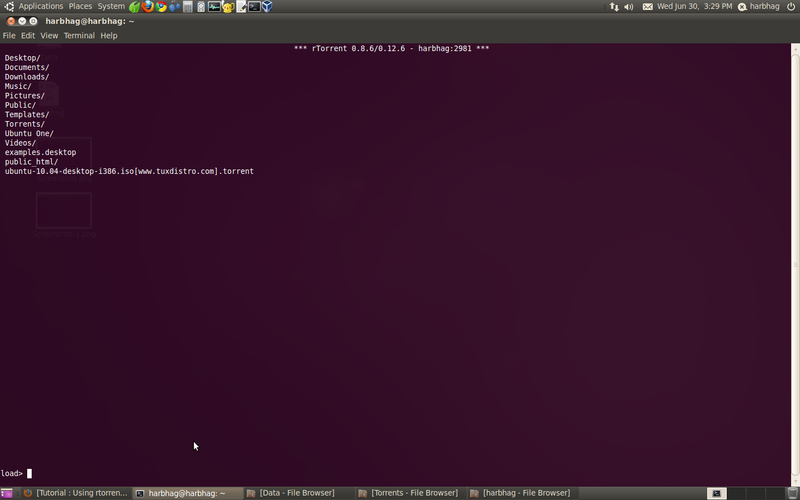 To demonstrate the usage to rtorrent we will download the latest version of Ubuntu from here via torrent . So download the torrent file and save it in your computer . I downloaded the file and saved it in /home/harbhag/ where harbhag is my username for the system . Here you can see that in the end of the screen is load> , so here rtorrent is asking to load the torrent file to start download . Here it is showing the list of all the Directories and files present in my home directory . Now you can see that in the end of the list it is showing torrent file that i just downloaded . If you also saved the file in your home directory then you will also see this file (ubuntu-10.04-desktop-i386.iso[www.tuxdistro.com].torrent) along with the other files and directories present in your home directory . Now enter u (first letter for the torrent file) and hit TAB and it will automatically load the torrent file for you like below . Now press Ctrl key and s key together (i.e. Ctrl+s) and your torrent will start downloading and the numbers on the bottom of the screen will start changing . Congratulations now your have successfully loaded your first torrent in the rtorrent . Here you can find lots of information regarding peers and trackers and many more . To exit from this screen to go back to previous screen just press the LEFT arrow key . So thats all for now . If you have any problem regarding this tutorial or you are having slow speed or your are not able to do anything i explained here then you can ask me for help in the comments . Good luck ,cheers . And dont forget to replace foo with you username . So from now on rtorrent will automatically start downloading the torrents that you will save in watch (/home/foo/watch) directory . And if you will delete the torrent from the rtorrent , it will be automatically deleted from the watch directory . Enable Grayscale Printing in Canon Pixma MP250 series on Ubuntu . Configure Alpine to Send/Receive emails from Gmail . Don't miss a thing . Do you know how to use magnet links in rtorrent? try this tutorial here , but for this you need to compile rtorrent yourself . But I did compile it. 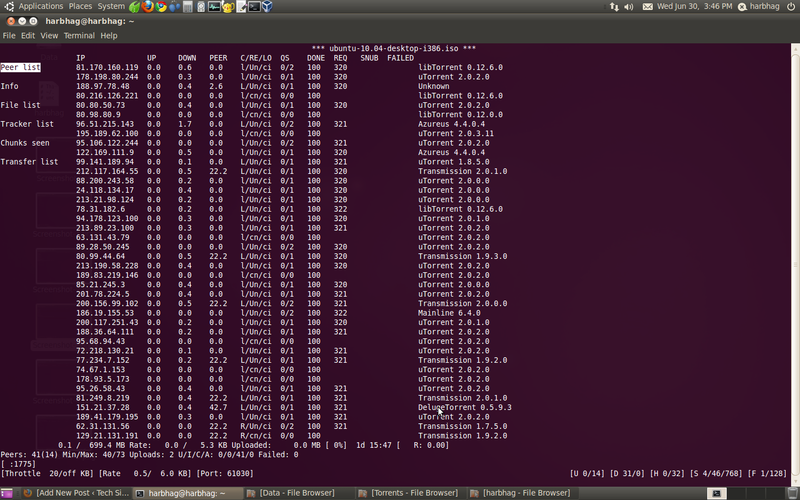 I have rtorrent commandline client installed in ubuntu 10.04 ..I use magnet url to download torrrent. I am witing a program which will receive info hash of torrent as input and find out whether seeeding for that torrent has started or not ? Can you tell me any why through which i come to know ? You can make the torrents autoload from a directory. This is too much of a bother, don’t you think? I myself use this feature but i thought it may be more of learning to explain how to add torrents manually . But as you pointed out this , so I will add this to the tutorial . Thanks for your suggestion . Keep em coming . I’ve been using Transmission for years. I’m curious what version you were trying out. Older versions were seriously deficient. On the other hand, I’ve never tried uTorrent, and I’ve heard that is the sin qua non of graphical torrent clients. I never had any problem with the efficiency of the transmission . But I had very strange problem with that . My ISP throttles my bittorrent speed so I never got max speeds in transmission even if I used highest encryption . This is the only problem that kept me from using transmission as my default client . I’m very confused…your example says: “To demonstrate the usage to rtorrent we will…download the torrent file and save it in your computer.” Then it says: “Now you can see…torrent file that i just downloaded .”, and then: “your torrent is loaded…Now press Ctrl key and s key together (i.e. Ctrl+s) and your torrent will start downloading.” My question is, if i’ve already downloaded a torrent, why are you telling me to download it again, using rtorrent? Isn’t that a waste of time and disk space? Is there a way to use rtorrent to download a new torrent file, that you haven’t previously downloaded? If I want to download a torrent from a website, can I do that ONLY using rtorrent? The second time I said to download torrent, that means I am talking about actual contents of that torrent and not the .torrent file itself. I am sorry if its confusing to you , I will try to update the article as I will get time. is there any way to limit the number of active torrents to one? also, can we schedule rtorrent to run only for specific durations in a day like we can in deluge/utorrent? A much better torrent client is Tixati. Tixati is way better than any of the above mentioned clients. I use it all the time for chatting and searching and sharing. Chatting is the funnest part. Why would you want to chat in a torrent client? I’d rather want a torrent client that is focused on downloading torrents. Chatting is better done with a dedicated chat program. everywhere and constantly reminding to use actual username? Nice rtorrent tutorial though 🙂 I’m using rtorrent myself. I want to know how much Total data my rtorrent 0.8.9 uploaded or seeded ??? Hmm the torrent stops seeding when i close Putty? or will it still keep on seeding? if it stops seeding can you please tell me how to make it so it seeds 24/7? If you start rtorent within a screen session it should keep running even when you detach and log off. Are you getting other results? I am getting an error “Using ‘epoll’ based polling.”,when i enter the filename and press enter….!! When i press ctrl+s it says “target of wrong type command used”!! You are issuing command while not selecting file to which that command should be applied. You can choose file by tapping up/down keys on your keyboard. Is there no system like pause in rtorrent?? Can i log those stats (peers,seeders,uploaded bytes…etc) into a file ? Reading torrent file failed. what can i do now? unfortunately the link you posted just before the configuration manual: (http://libtorrent.rakshasa.no/export/1170/trunk/rtorrent/doc/rtorrent.rc) isn’t working. Can you please fix it? Is it a text file and can it be actually edited in Windows and then uploaded to linux? I am using a linux with console only right now and would need some help here. Ok, but I still need to make the changes you described above, don’t I? And one more thing: When you say that we should ignore the message “.rtorrent.rc not found”, why the configuration and putting it in the directory? Is there a way to change the directory for that file? I am using koding.com (a linux virtual machine, maybe would be useful for you to know it) and it is a little bit tricky to put files in the user directory..
the download that it links “this” in “Configuration part 2.” isn’t available anymore. I have no problem using a text editor to change a file in terminal but I don’t know what I should download in place of the “this” file. The site took it down because of violation of terms of service. “this’ file still missing. Is it possible to upload it to another site? pastebin maybe? Thanks dude, you are time saving. I was stressed when my system only allowing me to use headless server, without any gui. I’ve been googled so many site that only explained how to setup an gui torrent client. But you my friend are the only helper that helped me to setup an cli torrent client. So thanks again.